By Ben Smith, Special to The Atlanta Progressive News. 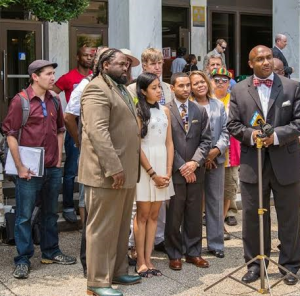 (APN) DECATUR — On Friday, August 08, 2014, the trial of the “Avondale 4” came to a close after the jury failed to reach verdict, thereby forcing DeKalb County State Court Judge Dax Lopez to declare a mistrial. The case stems from a protest that took place last August 2013 at the longtime home of Desert Storm Veteran Mark Harris in Avondale Estates. The four defendants–Tim Franzen, Daniel Hanley, Mariam Asad, and Harris–were arrested when they refused to leave Harris’s property following his eviction at the hands of mortgage holder Fannie Mae. Alongside Harris, the three other co-defendants in the case are activists from Occupy Our Homes Atlanta (OOHA), a housing justice group that had backed Harris’s protracted struggle to stop Fannie Mae from foreclosing on his home. The mistrial followed an extended period of jury deliberation that had begun the previous afternoon, Thursday, August 07, at around 4:30 p.m.
After two hours of initial deliberation, the judge had ordered the jury to return the following day for further consideration. By mid-afternoon on Friday, however, the jury remained deadlocked. In discussions with several jurors following the trial’s conclusion it was revealed the jury had split by a margin of five to one on the first set of charges brought against the defendants, and four to two on the second set. In both cases, the majority had favored conviction. It is unclear, however, whether DeKalb Solicitor-General Sherry Boston plans to convene a new trial in light of both the politically-contentious nature of the case and the relatively minor nature of the charges. Meanwhile, the four defendants, their lawyers, and the dozens of activists who stood beside them throughout this debacle, greeted the outcome with noticeable relief. The defendants said the mistrial was a victory, even if a complete acquittal would have been preferable. Had they been convicted, the defendants could have faced a maximum of twelve months in jail. During a press conference held outside the DeKalb County Courthouse in Decatur, Franzen called attention to the political injustice at the heart of the case. The trial is just another chapter in a prolonged struggle for justice on behalf of Harris dating back to October 2012, when Harris first received notice that his home was being foreclosed upon. As previously reported by Atlanta Progressive News, Harris had lived in his home since 1996. In the wake of the foreclosure, Harris turned to OOHA as a last-ditch effort to try to save his home and force Fannie Mae to negotiate an adjustment to his mortgage. OOHA activists worked alongside Harris to organize a campaign aimed at putting pressure on the company. The publicity generated by this campaign succeeded in forcing Sallie Mae to change their tune, at least temporarily. In November 2012, Fannie Mae began a series of ongoing negotiations with Harris that lasted for the remainder of the year and well into 2013. Before the end of the year, Harris’s discussions with the company led him to travel to Washington, DC, to meet in-person with Fannie Mae representatives. Beyond this, Harris apparently sent a 2,600 dollar check to Fannie Mae as a “good faith” payment in December 2012. By all accounts, the company promptly cashed the check, a development that led Harris and OOHA to believe they were making headway in negotiating a settlement. Fannie Mae appears to have had different plans, however. By early 2013, Fannie Mae was pressuring Harris to accept a rental agreement for the home, an arrangement that would have effectively forfeited Harris’s ability to win a modified mortgage. Harris declined the offer. Following this, Fannie Mae abandoned the negotiations, but never made an attempt to inform Harris that the negotiation process was being brought to a formal end, or that they had begun taking steps to evict him from the house. Activists believe that officials at Fannie Mae sought to get their hands on Harris’s home once and for all without also provoking another wave of resistance from OOHA. Harris was left completely unprepared for what was to take place on August 09, 2013, when at about 8:15 a.m.–while Harris was still asleep–a contingent of DeKalb County Marshals entered into his home and evicted him at gunpoint. After ousting him from the home, a team of hired movers was then summoned to the property to begin extricating Harris’s belongings from his house. The movers dumped everything they found–what amounted to a lifetime’s worth of accumulated belongings–into disorganized heaps on the front lawn of the property. Harris began contacting OOHA activists for help. During the course of the following day and a half, Harris was joined by dozens of supporters and fellow activists who made the trip to Avondale Estates after receiving a text message or hearing word on Facebook. The conflict came to a head the following day, when Avondale Estates police apparently informed protesters of their intent to clear the property. In opposition to the unjust eviction and foreclosure, the “Avondale 4” remained situated at the top of Harris’s driveway in the minutes leading up to the deadline set by police. Harris and Franzen stood at the top of the driveway and held a sign proclaiming, “No more homeless veterans.” Meanwhile, Hanley and Assad sat on the ground beside them with their arms linked and bound together inside a trash can filled with cement. In the end, the four protesters were each charged with counts of trespassing, while Hanley and Assad also were charged with obstructing an officer. The four activists were represented pro bono by a team of attorneys that included Mawuli Davis from the Davis Bozeman law firm; Joshua Davis from the firm J.G. Davis & Associates; as well as a pair of solo practitioners, Shawn McCullers and Andrea “Dionne” McGee. In December 2012, Mawuli Davis also headed up the ten-person legal team that successfully defended the group of 52 Occupy Atlanta protesters arrested during the police raid of Woodruff Park during the height of the Occupy movement. For its part, the state prosecution had approached this trial–which began on Wednesday, August 06, 2014–with a legal strategy aimed, above all else, at blocking the defense from presenting evidence and raising arguments that dealt with broader issues surrounding Harris’s foreclosure and eviction at the hands of Fannie Mae. In contrast, throughout the trial, the defense team sought to raise broader questions relating to Harris’s foreclosure and his protracted struggle to save his home. From the start, it was clear they would be barred from turning the case into a trial over Fannie Mae’s illegal foreclosure practices and conduct. Nonetheless, the team of attorneys did their best to make the trial as wide-ranging and political as possible. Judge Lopez sided with the prosecution throughout the case. At every step of the way, he barred the defense from presenting evidence or raising arguments that called into question the allegedly fraudulent and illegal activity of Fannie Mae and other lenders and banks involved in Harris’s case. Judge Lopez’s view of the case largely paralleled that of the state prosecutor. Indeed, Lopez clearly believed the four defendants were guilty, an opinion he openly expressed on the second day of the trial during a series of exchanges with the defense team. Beyond this, Lopez’s hostility to the defense was further revealed by his propensity for making snarky, condescending grimaces when overruling objections raised by the defense. Lopez’s most controversial decision came at the close of the trial’s opening day, when he ruled that one of the key witnesses for the defense–Florida attorney and legal expert on mortgage fraud, Lynn Szymoniak–would not be allowed to testify. The judge’s ruling came after Szymoniak, who had arrived at the Atlanta airport hours earlier in preparation for the case, had been called to the witness stand, sworn in, and begun to recount her credentials to the jury. As Szymoniak has since written on her blog, before she could finish introducing herself, the prosecutor cut her off. “Right after I told the jury that I had helped the Justice Department recover $95 million for HUD [the U.S. Department of Housing and Urban Development] from four major banks, the prosecutor jumped up flailing and yelling, ‘Whoa, whoa, whoa, whoa.’ Judge Dax Lopez sent the jury from the courtroom, sent me to a witness room, as the lawyers argued about whether I would be allowed to testify,” she wrote. In accord with his policy of preventing the defense from “relitigating the foreclosure,” Judge Lopez barred Szymoniak from returning to the stand and ordered the few sentences of testimony she had gotten out before the prosecutor’s objection to be stricken from the record. In the fall of 2012, Szymoniak had conducted a brief review of Harris’s mortgage documents at the request of OOHA. In a letter summarizing the case, Szymoniak had noted there was strong evidence that Fannie Mae and other involved parties had engaged in fraudulent activity in carrying out the foreclosure. The defense team still managed to pursue their planned legal defense. Their central argument held that Harris’s eviction–and, by extension, the subsequent arrests–had been illegitimate because, at the time, Harris legally qualified as a “tenant at will” at that property, due to his earlier payment of 2,600 dollars to Fannie Mae. “While the charges were totally bogus, we nonetheless welcome the opportunity to educate the public about the fraudulent activity of these banks and other such predators. The struggle continues,” Hanley said at the press conference following the mistrial.